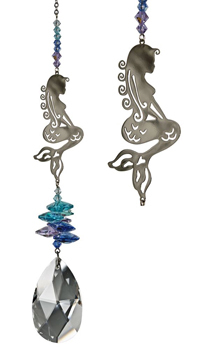 Now in a larger size, this suncatcher features a lovely mermaid whose curls cascade down her back. Mermaids are the sirens of the sea. Using their breathtaking beauty and seductive charm, they enchant sailors and fishermen alike. Not boxed, our Crystal Fantasies come ready to give with an organza gift bag.